To me, the butterfly dresses are a story of four generations. And hopefully more. Both dresses started out as a few small rectangles of silk fabric that my Grandma (my Dad’s mom) gave my Mom. The scraps were too small to be used for much, but my mother loved the print and managed to piece them together enough to make two tiny dresses for my sister and me when we were ages three and five. Sadly, the studio photograph of us hasn’t aged well (non-acid-free paper? 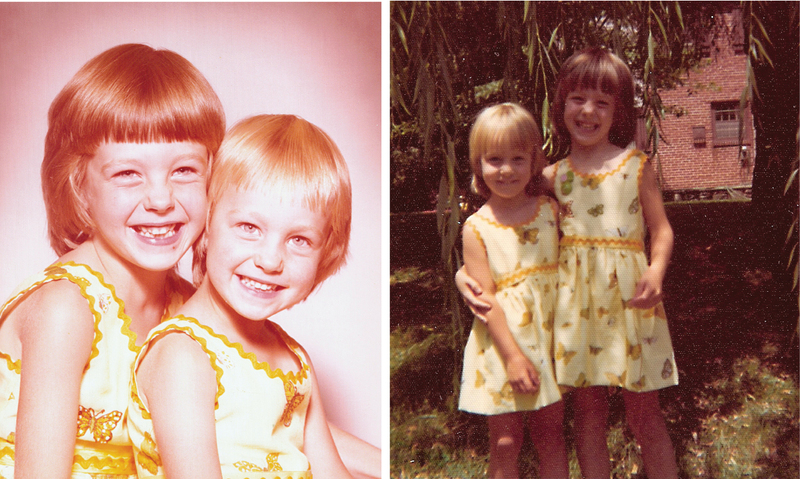 ), but here we are in our matching dresses. I think these photos were taken just after we had our first major haircuts! 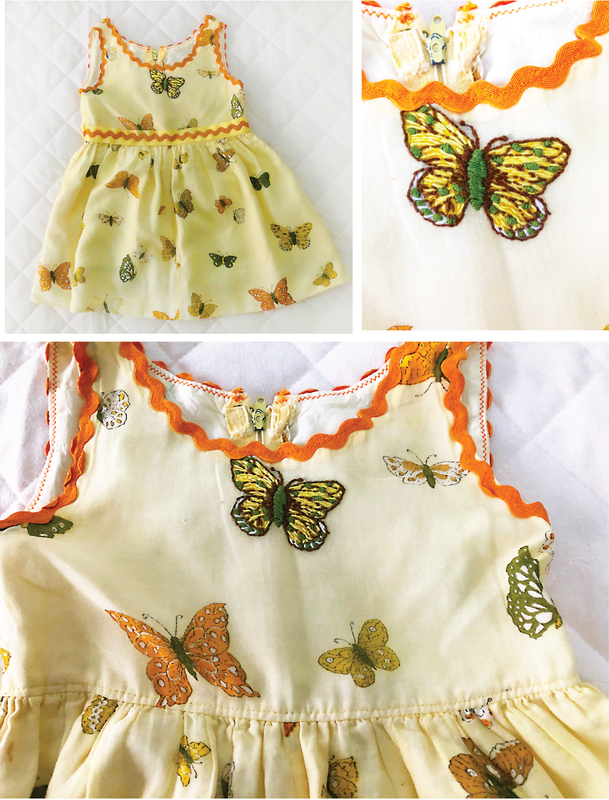 The butterfly dresses were clearly a labor of love for my Mom, with fabric passed down from my Grandma, to be worn by my sister and me and then by our own daughters. Mom once told me that the butterflies were an early attempt at embroidery for her, and I can attest to the fact that her embroidery skills have improved now far beyond where they were when she made these dresses. But to me that’s not important. She was proud of these dresses, and we were thrilled to wear them. 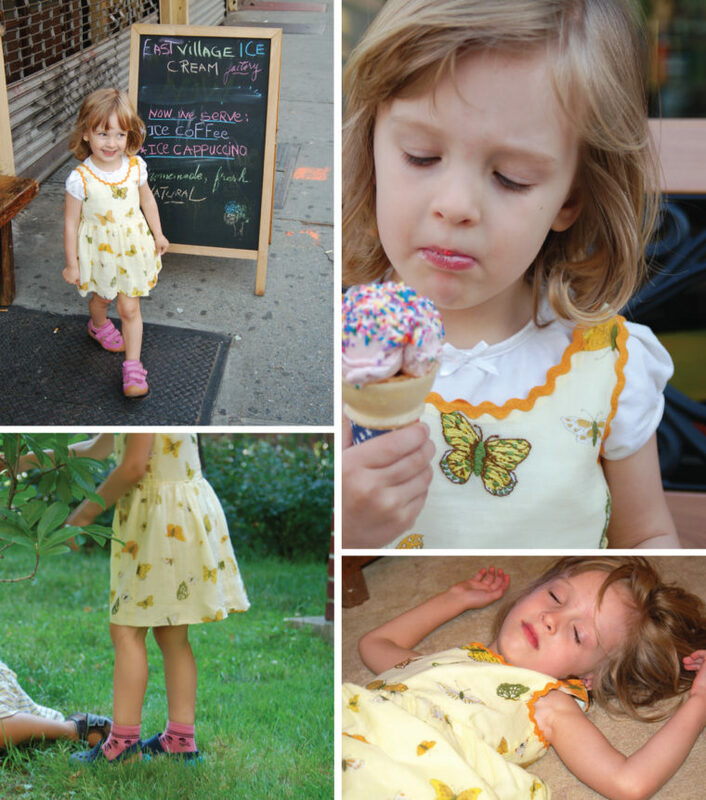 What’s more, I now have even more great memories of these dresses because I was able to dress my own kiddo in a dress that was once mine when she was the age I was when my Mom sewed them. I was able to tell S. the story of these dresses, and that I hope that she’ll tell her own stories to her daughter when she passes one of the dresses along to her someday. And I hope my niece will be able to do the same, especially since there are two dresses and a total of five sisters who wore them before they were passed along. Family memories, the love of a mother and a grandmother and a great-grandmother. I know my mother was giving us love as she sewed them and when she put these dresses on our tiny bodies, and I know that because, as a mother myself, I have had the pleasure of dressing my daughter in my own sewing as well as that of my mother. I think that’s why I sew. Would you like to contribute your own Sewn Story to our series? Email your ideas to askme@oliverands.com. I loved that story. None of the clothes my mother sewed for me survived. But I still have a skirt my grandmother made for me and some dresses my mother shocked for my oldest daughter before cataracts ended her smocking. I have saved most of the things I made my own daughters and a few I made my sons. Now if they will just give me grandchildren. Such precious memories bound up in fabric! I tend to pass on things I have made for my girls but this has inspired me to hold on to a few special items. I love the idea that they may pass them on to their children someday. Such a nice story and such a loving thought of your mom! My mom died when I was nine but I remember her sewing dresses for me(unfortunately none survived). but I always felt her love through those dresses. And that is why I sew. What a sweet story. Your mother (member of our local sewing guild) is an incredibly talented sewist. She’s lovely, isn’t she? Thanks for commenting! These dresses are so sweet. I have only a few items my mom made me using adorable plusses. But my great aunt Josephine sewed beautiful matching dresses for me and my dolls. She taught weaving at the Illinois State school for the blind. In Jacksonville, Illinois.That is why I sew. Oh, that’s wonderful! Thanks, Susan! How beautiful! So precious to have something to hand down.